Discussion in 'Help From Above' started by Smokey15, Jan 28, 2018. Today, at 6pm, my Big Brother, Don passed into heaven from complications starting with pneumonia. I was there, at his side when he passed and I got to tell him, "You can't pick your siblings, but if I could, I couldn't have picked a better Big Brother than You." and that I loved him very much. He was coherent at the time and he responded. Don was surrounded by family when he passed peacefully into Heaven. He lived by the word of God. Now he walks along side Him. Nailhead Ronnie, docgsx and Dadrider like this. I am sorry for your loss. You and your brother were fortunate to have the relationship you did. Sounds like it was very special. Jerry, I most definitely know what you mean! When my big brother passed I read the eulogy at his funeral. Its was titled "The best Big Brother a kid could ever have!" My thoughts and prayers go out to you and your family. Sorry for your loss, I to have a big brother and he to is very special. I am sure you have many fond memories that will help you through this time. My prayers are with you and your family. It's nice you were there for his final moments. Some don't get to. Helps with closure of a loved ones life. Hold on to all the memories! I was with my father when he passed but he was so far gone I doubt he knew I was there. Your fortunate to have had the opportunity to communicate with him before his passing. Dang Jerry, that's got to be tuff. Praying for you and your family. Sorry for you and your families loss..
Wishing you and your family the best during this difficult time Jerry. So sorry to hear your brother has passed and so soon after the loss of your step daughter. My prayers and sincere condolences go out to you and your family. Thank You my Friends. My birth father, whom I never met, taught Don how to repair cars. Don used to come out and help me in our shop. He rebuilt the carb and we did the complete brake system on our '65 Skylark. He and my Sis-in-law drove it in a couple cruises. My heart felt condolences to you and your brother's family for they'r big loss,our prayers are with you and family.Bruno and family. Donald LaVern Hudson, age 83, passed away into the arms of his Lord and Savior on Sunday, January 28, 2018, surrounded by his loving family and friends. Donald was a regular attendee at Heritage Baptist Church for several years. He loved and played music, playing the cornet and harmonica, as well as singing in a Christian group. 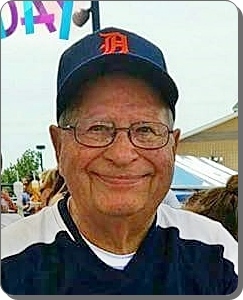 He was a big Detroit Tigers fan and an active bowler and former softball player. Surviving are his wife of 61 years, Ellen; children, Daniel (Lois) Tuck, Dale (Sue) Hudson, Linda (Alvin) Woudwyk, LaVonna (Jeff) Stempin, Marcia Kossen, Reva (Harvey) Mollitor, Donald (Angela) Hudson; 34 grandchildren, and 44 great-grandchildren. One of 17 children, Don is also survived by a brother-in-law, sister-in-law, many nieces, nephews, cousins, and friends. The family will greet visitors on Thursday, February 1, from 2 - 4 and 6 - 8 pm at Stroo Funeral Home. The funeral service will be held 10:00 am Friday, February 2, at Heritage Baptist Church, 1570 60th St. SE, with Pastor David Graef officiating. Interment in Rosedale Memorial Park. Memorial contributions may be made to Heritage Baptist Church Music Ministries. Nailhead Ronnie, 1972Mach1 and Dadrider like this. So sorry to hear about your loss, Jerry. My thoughts and prayers are with you and your family......sounds like he was a great man. You two will be together again. Praise God for Donald’s life, testimony and now his eternal reward!!! Doo Wop Where were you in '62? God Bless. Love and Prayers sent from my family.